Britain has been reminded that Brexit could still go badly wrong. The chief European Union negotiator warned Friday that deep differences between the two sides mean Britain could crash out of the bloc in March 2019 without a deal that protects trade with its biggest export market. Britain wants a transition after Brexit that will avoid businesses having to adjust to new rules and regulations twice. The EU is open to such a deal, but only if Britain agrees to play by its rules. "To be quite frank, if these disagreements persist the transition is not a given," Michel Barnier told reporters. "Time is short, very short." The reality check sent the British pound as much as 1% lower against the dollar. "Businesses want to see both sides doing everything in their power to agree a transition agreement as soon as possible -- not a political war of words," said Adam Marshall, director general of the British Chambers of Commerce. The stern warning from Barnier caps a turbulent week in which Japan made clear its companies could quit the U.K. if Brexit goes badly, and a broad cross section of businesses called for urgent clarity on London's plans. 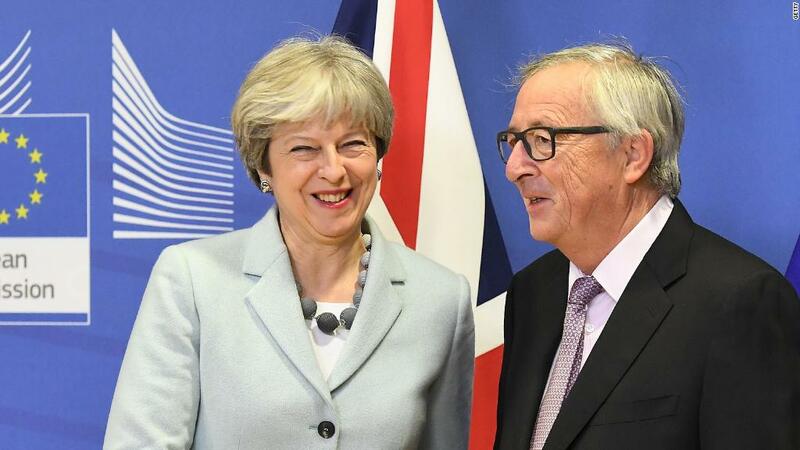 There are only 13 months to go before Brexit, yet Prime Minister Theresa May and her senior ministers remain divided over how close a relationship the country should seek to retain with the EU. Meetings between May and her cabinet this week appear to have done little to produce a breakthrough. Barnier said that British officials had canceled a meeting with him for Friday at which they were expected to detail their position because of a scheduling conflict. May's office did not respond to requests for comment. A spokesman for the government said earlier this week that it believes it can achieve "as frictionless as possible" trade with the EU because doing so is in the interest of both parties. Businesses will be able to wait only so long. Japan's ambassador warned Thursday that its big companies -- and others -- would have to leave the country if trade barriers after Brexit wipe out their profit margins. "So it is as simple as that," Koji Tsuruoka told reporters. "This is all high stakes that all of us, I think, need to keep in mind." Some of the fault lines between Britain and the EU are apparent. Analysts say that avoiding a physical border -- along with related "checks and controls" -- means that Britain must remain very close to the EU. One potential solution -- staying in a customs union with the EU -- has been ruled out by May. The EU is still waiting to hear how Britain proposes to resolve the issue. "A U.K. decision to leave the single market and customs union would make border checks inevitable," Barnier said. The terms of the transition must also be addressed. Europe says it will allow a transition only if Britain is willing to accept all EU law -- including new laws passed during that period -- and EU judicial oversight. Britain has pushed back against that position. It does not want, for example, to give residency rights to EU migrants who arrive after March 2019. "The time has come to make choices. We await with great interest the choices to be made by the British government," Barnier said. David Davis, who represents Britain in the negotiations, said he was "surprised" to hear that there was confusion over the U.K.'s position. "We must not lose sight of the ultimate aim here -- to build a new comprehensive partnership between the U.K. and the EU that sees us stay as the closest of friends and allies," he said in a statement.